Published: Sept. 30, 2016 at 12:15 p.m.
We're nearing the quarter-pole of the NFL season and getting a good idea of which players could help win fantasy championships. But things are constantly changing in the NFL, which means things are changing in fantasy football. Stockwatch, baby! 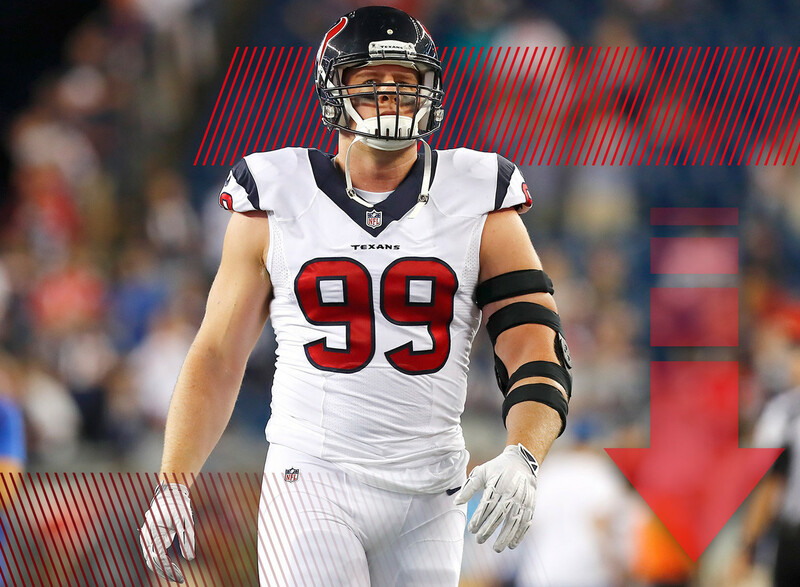 If you drafted the Texans defense, you were doing it mostly because of J.J. Watt. Now that Watt is likely done for the year after back surgery, this whole unit takes a hit. Even though Watt didn't look like the same player in the snaps he took this season, simply his presence meant he needed to be accounted for. This is going to put extra pressure on the players upfront -- notably Jadeveon Clowney -- to try and fill his enormous shoes. It might be time to start streaming the position. Everything points to Washington seeing plenty of opportunities to shine this week against a bad Bears defense. The reports from Lions practice suggest a very confident running back who knows he'll see plenty of snaps this week. After Detroit struggled to get an inside running game going with Theo Riddick, Washington showed that he can be the power runner that the Lions want to feature in the offense. After Jameis Winston threw the ball 58 times in a loss last week, Buccanneers coaches admitted that they need to run the ball more often. It was after a 43-attempt performance last season that the Bucs began emphasizing the run and Doug Martin took off. Could the same happen this season beginning with a Broncos run defense that has been more vulnerable than many originally anticipated? It appears that Taylor and the Bills will have to endure another week without Sammy Watkins. Last week, Tyrod posted a decent fantasy total thanks to a couple of big plays to Greg Salas and Marquise Goodwin. Turns out the Jets secondary might not be that great. Now the Bills face a Patriots team that has had 10 days to prepare. There's nothing about this matchup that seems to go in Taylor's favor. Go back and watch last week's game and you'll quickly see that Pryor is just a flat-out good football player. The Browns might have used him in the wildcat a few times, but he's not a gimmick. There are still quarterback issues in Cleveland, but Pryor has the makings of a very good wide receiver. His talent and size should make him a matchup nightmare for the Washington defense this week. With Shane Vereen out indefinitely, the door is open for Jennings to be a workhorse in New York. Unfortunately he's been battling a thumb injury that kept him out of last week's game and is likely to do the same in Week 4. Not that starting him against that ferocious Vikings defense would have been a good idea anyway. Things were already looking up for CAP with a matchup against the Falcons in Week 4. But it looks like the second-year back could be installed as the starter for the foreseeable future with reports that Jonathan Stewart could be out up to a month. Artis-Payne looked good at times in the loss to the Vikings, which bodes well for his next challenge against a much more pliable Atlanta defense. Just about everything went wrong for the Jets passing game last week. While Ryan Fitzpatrick's six interceptions drew the headlines, the bigger story might have been Eric Decker aggravating a shoulder injury and now looking very unlikely to play this week. This comes in addition to Brandon Marshall not being at 100 percent coming into the game. Gang Green picked the wrong time to run up on the Seahawks. To say that Tate has underwhelmed this season would do a disservice to all things underwhelming. Through three games he has just 94 receiving yards and no touchdowns despite being the second-most targeted player on the roster. A big part of the problem is that Tate has struggled after the catch, a facet in which he normally excels. The upside is that offensive coordinator Jim Bob Cooter vows to get Tate more targets. More opportunities can't be a bad thing, right? Simply put, the Ravens' run game has been bad. Terrance West has been the best of the bunch with 119 rushing yards on 3.6 yards per carry. Forsett hasn't even reached that level. It's enough to get John Harbaugh to admit publicly that there will be changes in the backfield. Enter Kenneth Dixon, who is set to make his NFL debut in Week 5. At this point, Forsett is likely occupying a spot on your roster that could be used for a more productive player. You can drop him.